The following numbers are subject to the usual caveats about statistics, but I will present them at face value as I believe that that the general trend they represent is real: in the United States, among the general population, 83% believe in God. Among scientists, 33% believe in God. 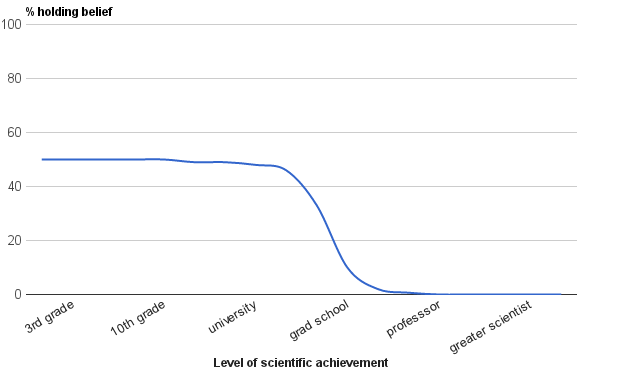 Among "greater" scientists (members of the National Academy of Sciences), the number is about 7%. How could this be, if science and Christianity are compatible, as I have claimed? Doesn't this clearly show that science disproves Christianity? That they are incompatible? No. The fewer number of Christians in the higher level of sciences are due to sociological factors rather than due to fundamental incompatibilities between the two worldviews. In the rest of this post I will address the issue of incompatibility, and in my next post I will address the sociological factors. 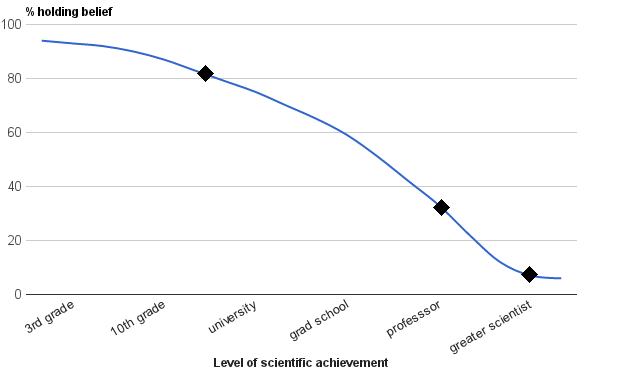 First, let's consider the distribution of theists along the "scientific achievement" axis. 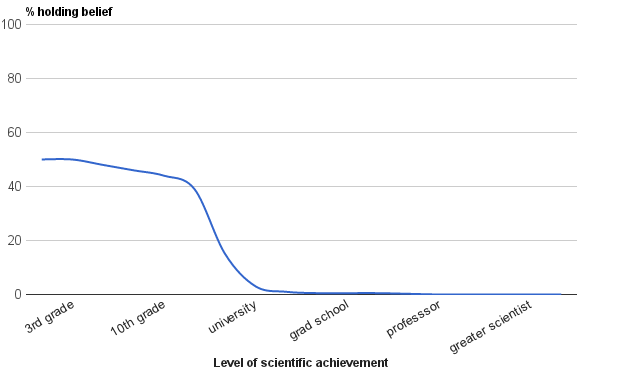 Divide the American population into categories by the highest level of scientific achievement that a person attained. Plot that on the x-axis. Then in each category (that is, for each x-value), plot the percent of people who believe that God exists, on the y-axis. If we suppose that there is a fundamental scientific incompatibility between Christianity and science - if Christianity is simply scientifically wrong - what would you expect this distribution to look like? In general, a belief that's definitively, scientifically wrong will display characteristics of the above graphs. The graph starts out at around 50%, because people who are totally ignorant of the question start out by just guessing. It then slowly decreases as people become more exposed to the correct answer, and then it drops to virtually zero as people eventually reach a solid, scientific understanding of the question at hand. Thereafter, those who are further along on the "scientific achievement" axis are nearly unanimous in the rejection of the incorrect belief - which is what makes it possible to speak of a scientific consensus. The precipitous drop and the consensus afterwards remains even for a controversial belief, such as evolution or global warming. There is a fairly distinct, step-function like quality to the whole graph. I consider all this to be obvious enough that, although I don't have data or studies on this particular issue, I feel confident in using this qualitatively in my reasoning. If anyone does have data or studies, by all means please inform me. I would be grateful. I marked the three statistics I mentioned at the beginning as diamonds on the graph, taking the "general population" to have a high school/college education in the sciences. I then filled in the rest of the distribution based on a combination of data from this graph on this website, the perception of the culture at large, and personal experience. Again, if anyone has better data, please let me know. This is a qualitatively different graph than the ones showing scientifically false beliefs. There is no sharp turn - off as one achieves a solid scientific understanding of God's nonexistence. There is no clear level of scientific achievement beyond which there is clear scientific consensus. The only possible location for such turning point (which is still a stretch) would be between "university professor" and "greater scientists", but that seems impossible, for several reasons. Firstly, that would mean one can finish graduate school and obtain a PhD in a relevant field without ever learning about the very important scientific result that there is no God. Secondly, there would be tremendous conflict over this very important question between "greater scientists" and "lesser scientists", and furthermore this conflict would take the form of the "greater scientists" accusing the "lesser scientists" of scientific ignorance and stupidity. Lastly, even the supposed 7% figure is not nearly enough to point to scientific consensus, although it may look small. The poll was asking about personal convictions, not professional scientific opinions, and there are also a sizable portion of scientists who expressed agnosticism. Compare that to controversial things that truly do have scientific consensus - such as the issues of global warming or evolution - which weigh in at 97+% consensus of ALL scientists (that is, including the "professor" level). All of this demonstrates that God's existence is scientifically undecided, and therefore suggests there there is no fundamental conflict between Christianity and science. Of course, there is a shortcut through all this that answers the question quite simply. Why not directly ask the National Academy of Sciences (NAS) - the group of these "greater scientists" - whether there is a conflict? Surely that would settle the question, as they are the "greater scientists", and that 7% statistic which is supposed to represent them is the strongest evidence against compatibility. Well, the NAS has addressed that very issue, and has clearly stated that there is no fundamental disagreement between science and religion. They've also endorsed individual Christian members who are outspoken on the compatibility between religion and science. Oh, and if the NAS isn't good enough for you, then we can always go that patron saint of those who claim incompatibility, someone who's been called the father of modern science - Galileo Galilei. But Galileo was actually fully Catholic, and he believed that there is perfect harmony between science and Christianity throughout history, as he spells out in this lengthy letter. You may now say, "Well if you were going to just take that shortcut anyways, why did I have to look at all your wobbly graphs?" Because while the NAS and Galileo clearly state that there is compatibility between Christianity and science, we still haven't answered why there are so few Christians among scientists. In fact the question becomes more acute: if it's not due to incompatibility, then why? Our reason should not only explain why Christians are few in number in the sciences, but also why the distribution of Christians along increasing levels of scientific achievement has that particular shape in my graphs. This is what I'll cover in the next post of this series. An analysis of "Let It Go" in Disney's "Frozen"